Food related illnesses are the root of calls to Florida poison-control centers every day. These calls are related to food that appears to be spoiled or expired, that looks or smells wrong, that has been left out for too long, or that has mold on it. Sometimes foods that appear perfectly fine may lead to illness and fatalities. When these incidents involve to a public restaurant and cause illness or death, can you sue? A good personal injury attorney can help make that determination. Sadly, Florida has had its share of restaurants fail health inspections. In fact, the number of restaurants in Central Florida alone with failed inspections in 2016 tops 100. Many of these places experienced temporary or permanent closure. We can only wonder how many regulation violations led to human illnesses. The truth is, if you can tie your illness to a particular food item, you may have cause to sue the restaurant that served you. You may even have reason to go after a grower, processor or distributor. Pathogen identification: A medical professional must determine the source of the health impacts. Common bacteria found in foods include Campylobacter, E. coli, Shigella, Listeria, and Salmonella. Other pathogens that may lead to negative health impacts are Hepatitis A. and Norovirus. DNA “Fingerprinting: Bacterial illnesses can be traced by looking at the DNA fingerprint of the offending bacterial. If more than one person became ill, it could be determined whether or not the illness came from the same place. Common Source: Even if the particular food that caused illness is never identified, if a number of people who ate at the same restaurant all experience symptoms, health officials may conclude that the restaurant is the common factor and therefore responsible for the onset of the illnesses. Food Handlers: When food handlers do not follow hand-washing requirements, surfaces that come into contact with food may become infected with pathogens, resulting in illness. Leftovers: Leftovers from the meal that caused your illness may contain evidence to support your case. Regulations: If the restaurant has blatantly violated safety regulations that result in your illness, you may have a claim of gross negligence. What Will the Suit Encompass? If an investigation indicates that a restaurant is, indeed, responsible for your illness, you may be able to recover compensation for your medical expenses and lost income associated with your illness. Additionally, it is possible to recover damages for pain and suffering and emotional distress. If a case is made for gross negligence on the part of the restaurant, punitive damages may be indicated, as well. 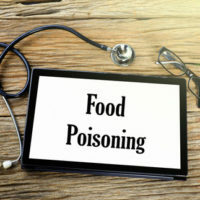 If you believe you experienced food poisoning due to consuming a meal in a restaurant, our personal injury team at The Law Offices of Robert W. Elton can assist in your pursuit for justice. Contact our Daytona & Ormond Beach offices today for a free, confidential consultation.